Puerto Caldera & Puntarenas Costa Rica Shore Excursions | Best Deals! Looking for all the best things to do in Puntarenas Costa Rica? You have come to the right place! The Real Deal Tours brings you the best selection of discounted public and private Puntarenas tours & Puerto Caldera shore excursions in Costa Rica. 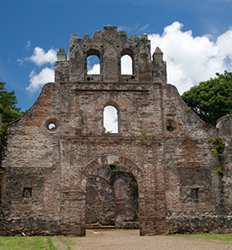 Our public Puntarenas shore excursions are all done in small groups. In general for all our Costa Rica shore excursions, the maximum group size is between 18 and 20 people. Therefore, this is a much more intimate experience than the large bus tours available on your cruise ship. Our guides are experienced locals that love to share their "pura vida" and passion for Costa Rica with you. We offer the same "No Port No Pay" policy that your cruise ships offer on all our Costa Rica shore excursions. Better yet, we offer the best deals on all our Puntarenas shore excursion too! At The Real Deal Tours Costa Rica, we did your homework. We have scouted out the best activities and things to do in Puerto Caldera and Puntarenas for you. Always dreamed of horseback riding on a tropical beach? 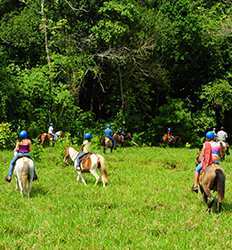 Check out our Costa Rica rainforest horseback riding combo! 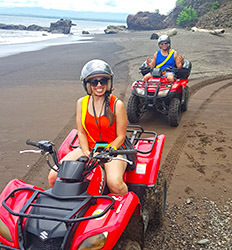 How about exploring Costa Rica's incredibly lush jungle trails on an ATV or Dune Buggy? We got that too! 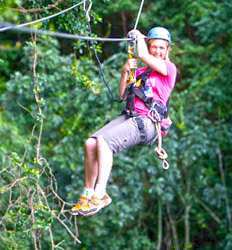 Let's not forget about the most quintessential things to do in Costa Rica, a zip line tour in the rainforest canopy! If you cannot decide on just one, then our Puntarenas 6 in 1 Highlights tour is your best bet for a taste of the best of Costa Rica in just one day. Looking for a more exclusive experience in Costa Rica? Then skip the public tours altogether and customize your own experience on one of our private shore excursions from Puntarenas. Allow our professional drivers to whisk you away in an air-conditioned van to the destination of your choice. We offer private tours to Monteverde cloud forest, Poas or Arenal Volcanos, Manuel Antonio National Park or to the capital city of San Jose. You can also customize your own Puntarenas tours. 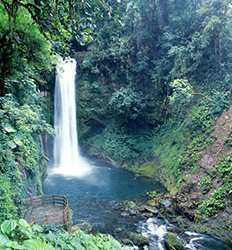 Just contact one of our Activities Specialists and we can help you design your dream excursion in Costa Rica. The Real Deal Tours offers the option of a personal bilingual guide. We highly recommend this option if you prefer to have an expert of all things Costa Rican along for the ride. Un-guided private tours are also an excellent option for those who have done their research and know exactly where they’d like to visit and just need a way to get there! Some of the best activities in the Pacific coast of Costa Rica are found in Jaco. At less than an hour’s drive south, Jaco is a hub of adrenaline pumping activities for all you action seeking cruisers. We’ve included a list of Jaco tours that offer pick-ups from the pier with a small transportation fee below. If there are other Jaco Tours you are interested, give us a call and we can provide you a quote for transportation. Whether you prefer to join one of our public Puntarenas shore excursions or customize your own private tour in Costa Rica, you can be sure you are getting the best deals in Costa Rica with The Real Deal Tours. Scroll down and take a look at all the fun things to do in Puerto Caldera and Puntarenas cruise ship ports today! If it is your first time cruising to Costa Rica, take a look at our Cruise Ship FAQ’s for some helpful tips! Looking to get the most of your Puntarenas Costa Rica cruise vacation? Our Puntarenas Highlights tour packs all the most popular things to do in Puntarenas into one amazing Costa Rica shore excursion! Discover the beauty of Costa Rica's Pacific coast, embark on a wildlife safari on a Tarcoles crocodile tour, discover the colonial past in Santa Lucia, explore the Puntarenas promenade and more! Join the fun! Perfect for adventurous families, the Puntarenas Eco Adventure is one of our top selling Costa Rica shore excursions departing from Caldera or Puntarenas cruise ship ports. 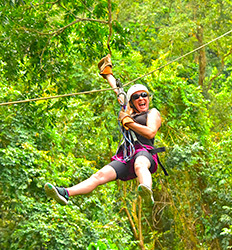 Enjoy the thrill of zipping through the trees on a Costa Rica canopy tour at Carara Adventure Park. Next, explore wildlife and nature on the Tarcoles River on a crocodile safari. Two exciting adventures packed into one amazing shore excursion in Puntrarenas! Puntarenas Eco Adventure Tour deposit is $20.00 per Adult and $10.00 per Child. If you are an avid birder, then you probably already know that birding Carara National Park in Costa Rica is spectacular. 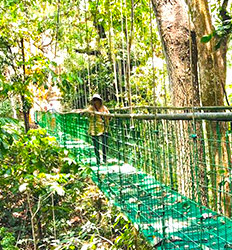 The Villa Lapas Sky Way is a trail connecting 5 different hanging bridges over 100 ft. high so you are at eye level with birds and other wildlife dwelling in Costa Rica's famous rainforest canopy. Combine that with an eco-cruise on the Tarcoles River to see some of the largest crocodiles in the Americas. 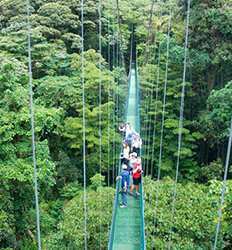 Costa Rica Hanging Bridges + Tarcoles River Eco Cruise Tour deposit is $15.00 per Adult and $10.00 per Child. In Costa Rica horseback riding on the beach is one of the most amazing ways to immerse yourself in the beauty of the rainforest lined Pacific coast. This top selling Puntarenas shore excursion takes you through dense rainforest trails and along some of the most pristine beach horseback riding in Costa Rica. Top off your day with a safari style boat tour on the Tarcoles River in search of gigantic crocodiles and you have one of the most amazing shore excursions in Costa Rica. 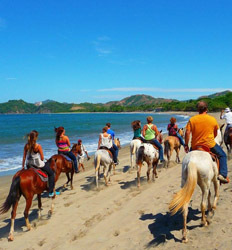 Horseback Riding on the Beach + Tarcoles Crocodile Tour Costa Rica Tour deposit is $90.00 per person. 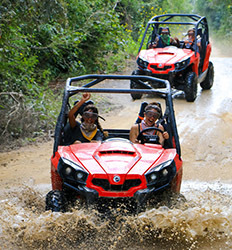 Hop on your own fully automatic ATV and explore the private off road trails of Carara Adventure Park! Waterfalls, beaches, rainforest and 14 different river crossings make this wet and wild off road adventure one of our top Costa Rica shore excursions. 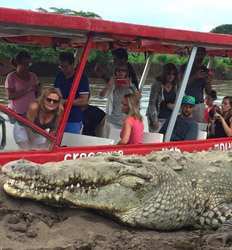 Top off your day “Crocodile Dundee” style as you seek out some of Americas largest crocodiles aboard a safari style boat on the Tarcoles River and you have one unforgettable shore excursion in Puntarenas! Rainforest & Rivers ATV Adventure + Tarcoles Crocodile Safari Tour deposit is $20.00 per Single ATV and $40.00 per Double ATV. With 14 river crossings, a waterfall, rainforest and beaches; it is no wonder the Carara Adventure Park jungle buggy tour is one of the top off road tours in Costa Rica. Add in a safari style boat trip on the Tarcoles River in search of gigantic crocodiles and you have one unforgettable Costa Rica adventure!! Book your discounted Costa Rica shore excursions in Puntarenas here! Off Road Buggy + Tarcoles Crocodile Safari Tour deposit is $50.00 per Single Buggy. Off Road Buggy + Tarcoles Crocodile Safari Tour - Driver + One Adult deposit is $80.00. Off Road Buggy + Tarcoles Crocodile Safari Tour - Driver + One Child deposit is $70.00. Off Road Buggy + Tarcoles Crocodile Safari Tour - Driver + Two Adults deposit is $100.00. Off Road Buggy + Tarcoles Crocodile Safari Tour - Driver + Three Adults deposit is $110.00. 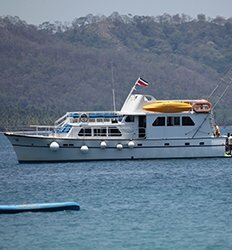 Looking for the best cruise ship shore excursion in Costa Rica? 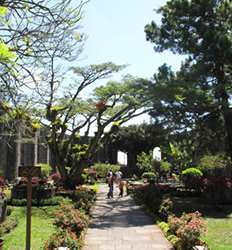 What better way to immerse yourself in Costa Rica culture than by visiting the capital city of San Jose? Vibrant with color and bustling with everyday Tico life, San Jose can only be truly appreciated up close and personal. Looking for the top cruise ship shore excursions in Costa Rica? Arriving to Puntarenas or Caldera cruise ports? Do you prefer the freedom of your own itinerary to the structured bus tours your cruise ship shore excursions offer? You have found the right place with The Real Deal Tours. 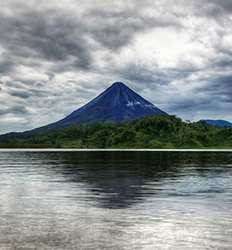 Beat the crowded sightseeing tours arranged by your cruise ships and take your very own nice, air-conditioned private sightseeing tour to Poas Volcano National Park using our private driver services in Costa Rica! Our Private Poas Volcano Tour allows you to plan your excursion at your own leisure whether you are travelling alone or with a group. Private Poas Volcano Express Tour deposit is $13.00 per Hour. There is no better way to explore Costa Rica than with your own private driver for the day. Your private chauffeur in Costa Rica is not like other cruise ship shore excursions, our private drivers can take you just about anywhere you would like to visit that your cruise ship itinerary allows. If you want to explore the beauty of the Costa Rica rainforest, the Vista Los Sueños Horseback Riding in Jaco is ideal for you! Horseback riding is a less demanding activity & enjoyable for the entire family. While on top of one of our gentle horses, there´s very little you need to do but sit back in the saddle, relax, and enjoy the ride! Jungle and Waterfall Horseback Riding Tour deposit is $15.00 per person. At the Vista Los Sueños Canopy Tour we can promise you one thing, you will hear shrieks and they are not just coming from the monkeys: shrieks of laughter, shrieks of fear, and shrieks of joy! The Canopy Tour at Vista Los Sueños is everything you could and would expect of an amazing canopy tour in Costa Rica. Vista Los Sueños Canopy Tour deposit is $20.00 per person. Fly through the tree tops on a canopy tour, roar through the jungle on an ATV tour all in one great Costa Rica adventure! The Los Sueños Canopy & ATV Tour combo is sure to be the highlight of your Costa Rica vacation, are offered both morning and afternoon, allowing you to custom-design your vacation schedule. Want to really get to know the Jaco region? Take the 2 for 1 concept into your into your own hands and explore the Costa Rican jungle by land in a fully equipped dune buggy AND by air flying through 12 exhilarating canopy zip lines! The Los Sueños Canopy and Jungle Buggy Tour in Jaco is a great way for the entire family.